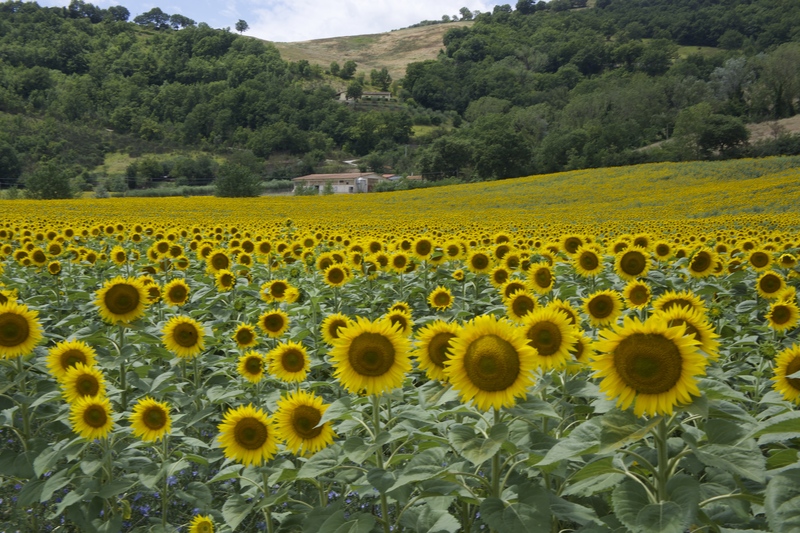 So many sunflowers on the way to Valfabbrica. 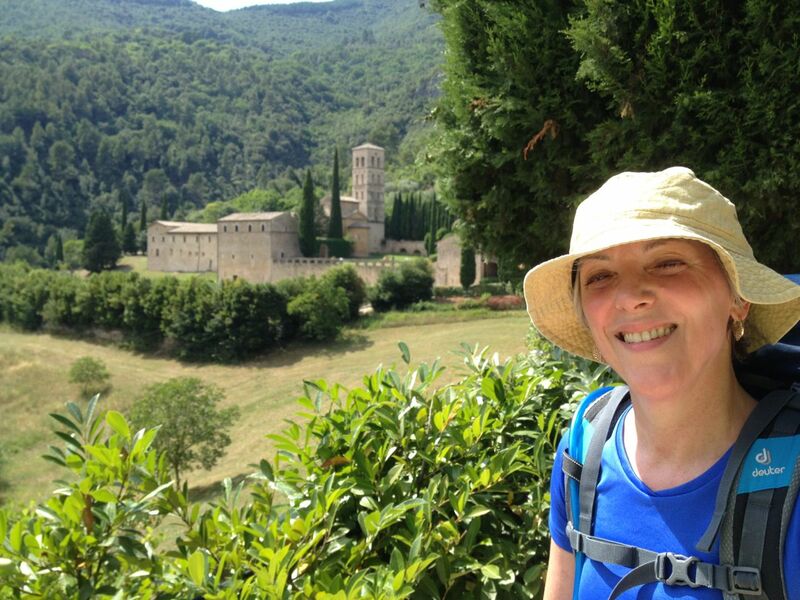 Here in Assisi, the halfway point of my walk from Florence to Rome, I’ve stopped, relaxed a bit, and had a few moments to take stock of this camino so far. Since I walked last year from Assisi to Rome I’m back in familiar territory. The last weeks, between Florence and Assisi, have been an exploration and discovery. 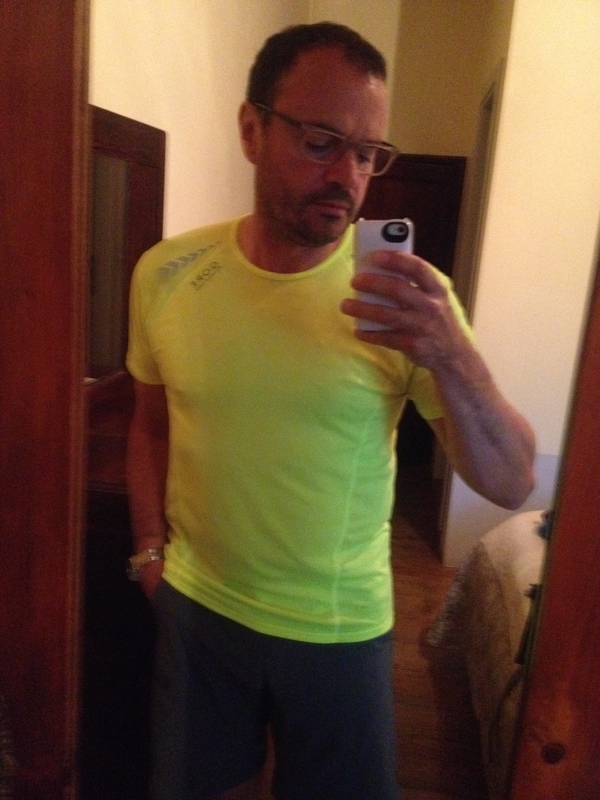 I set out on June 28 and today is July 12, so it’s been about two weeks of tough and beautiful walking. 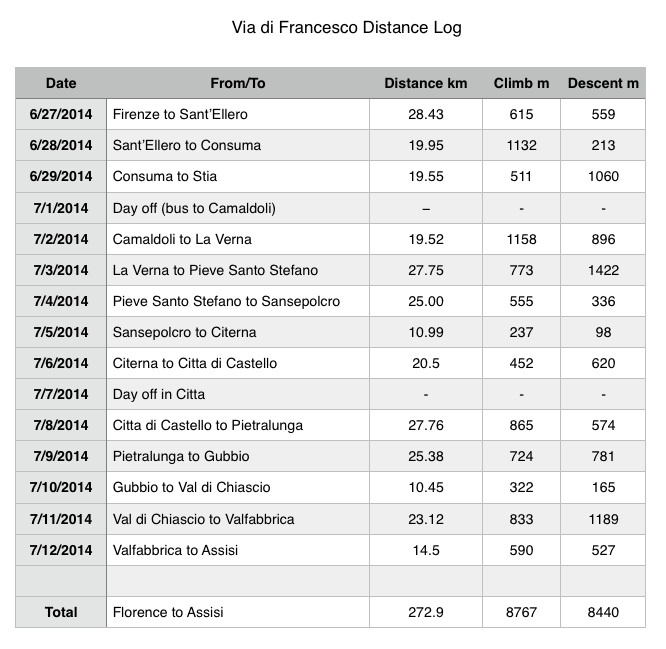 If you study the chart closely, you’ll see that I’ve walked 272.9km over thirteen days. That’s an average of 21 km (13 miles) per day. This is about average for me compared to prior caminos. What is different is the aggregate elevation gained and lost. Camino de Santiago regulars are familiar with the Route Napoleon from St. Jean Pied de Port to Roncesvalles, a very tough uphill/downhill day that crosses the Pyrenees with an elevation gain of 1240 meters. Averaged over the 13 days of this camino the elevation gain is a daily 675 meters — about half a Route Napoleon per day. Two of these days almost match the Route Napoleon for elevation gain, and while the Route Napoleon loses only 469 meters by the end of the day the average daily elevation loss on this walk is nearly equal to the elevation gain. On the bright side, though, there are some great views from the tops of these mountains around here. A question I’m often asked about this route is — are there low-cost hostels so you can keep costs down? The answer is a qualified “yes.” There are hostels, almost always located around parish churches or monasteries, but you have to call in advance to book a room. In some cases, you have to have the correct credential or you will be turned away (there are three quasi-competing caminos covering much of this territory). Most of the time I have chosen to share a double room in a hotel which has meant that my nightly cost is about €30-35 plus meals. 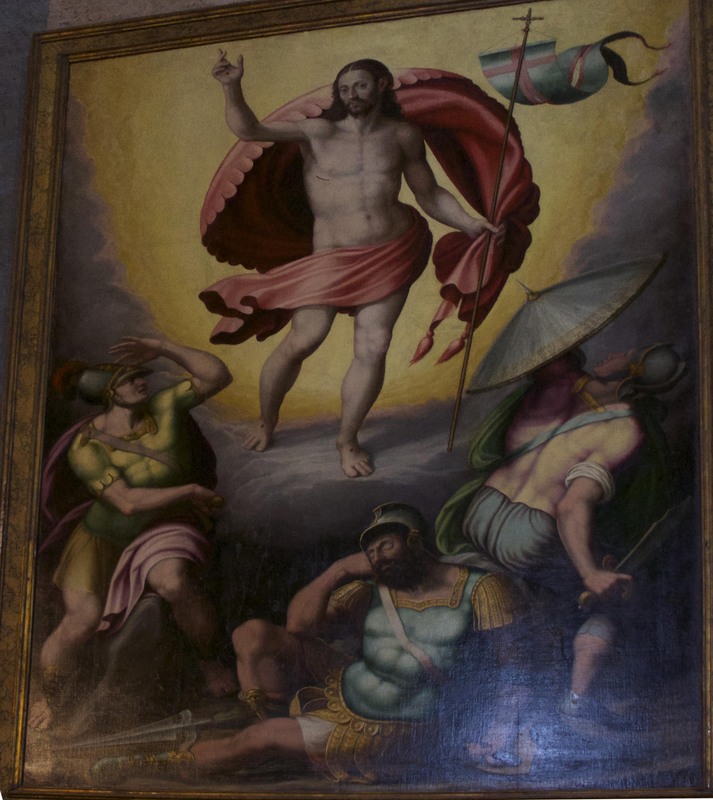 And this amazing 500-year old painting was just hanging there in the empty cathedral. Italians are famous for their food and you have to examine menus carefully to find inexpensive options. Breakfast is coffee and toast. Lunch is a panino. There’s always a snack in the afternoon. Dinner starts late — 8:00 pm — and can take hours and cost €€€ if you do the whole antipasto, primo, secondo, dolci ritual. People on a budget can turn to the “contorni” page (side dishes) find a mixed salad and then order a pizza or pasta for a main course, usually for around €10 total. Really the biggest question should be, “Is it worth it?” For me, the answer is unequivocal. Yes. If you’re in fairly good shape, find a part of this walk and do it. If you have a month and can handle it — do it. There are many sections that are very manageable for any average walker, and many of the harder ones can be avoided by taking a bus or train. If you’re not scared of exercise, you will be rewarded if you do the whole thing. The other day when I was walking around in the cathedral at Gubbio I started to realize how absolutely amazing this walk is. I walked from bay to bay on the left side of the nave and looked up at each individual painting hanging there. Here are masterworks of Virgilio Nucci and others from the 16th century — items any museum in America would be delighted to display. And they are just hanging there, almost ignored in this cathedral set high enough above the city that you really have to want to get there. The same is true in almost every corner of this territory. Walk into an old church and you won’t be surprised to see a 12th century fresco. This saint or that saint walked over here or over there. Here’s an Etruscan arch from before the Roman era. Here’s an aqueduct from the time of Christ. Or a mosaic. Or a sculpture. Or a tomb. Amazing. Funny, I have no photos of myself. But I did take one with the cool new shirt I bought in Vienna. And I, how am I? Health-wise, I’m fine. Tanned, a little lighter than before, a little sore in the feet and legs. Most of all, I’ve walked alone a lot. 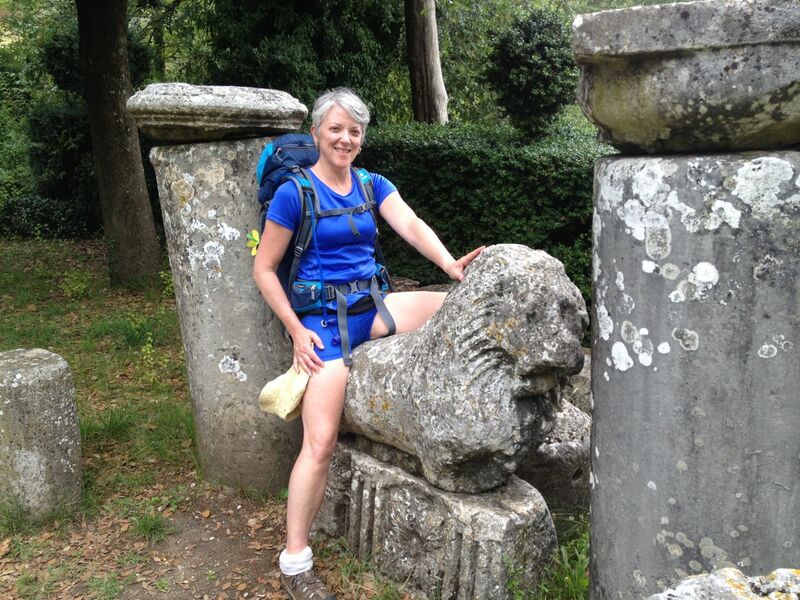 I’d hoped to walk for a week with Jacqueline, but her extreme knee pain kept her in buses and hotels. Since she joined me at La Verna she had only two walking days. But she was great company at other times during her eight days total on this trip. In terms of the book project, it’s going fine. I have dozens of pages of transcribed notes from each day’s walk. I’ll need to go back and redo a couple of stages, but I’ve covered the essentials for thirteen of the fourteen walking days. When I’m done with the remaining two weeks’ of materials I’ll hang out in Perugia for a month and gather my notes, work on the text itself, complete a thorough list of accommodations available each day, and then compile it all. I’ll be back in Seattle sometime just after Labor Day, and then will put the project to bed by the December 31 due date. The walk has felt very much like work — the hard work of muscles, legs and feet. Sweaty. Thirsty. Hungry work. I’m hoping it will be more playful in the days ahead, when Theresa and her sweet spirit are here to greet me every day and to share the walk. Sometimes from the middle of a project it’s hard to say, “Wow, this is great.” I know when it’s all done, though, I’ll look at this summer as a golden memory, a dream, a fantasy. But in the meantime . . . . tomorrow I walk. The panoramas are unbelievable. This is taken from Citerna toward Citta di Castello, tomorrow’s destination. All year I’ve been gearing myself toward thirty critical days, the four weeks plus two days in which I would actually walk the route that is the subject of my upcoming guidebook. It’s hard to believe that I’m nearly one-third of the way through. 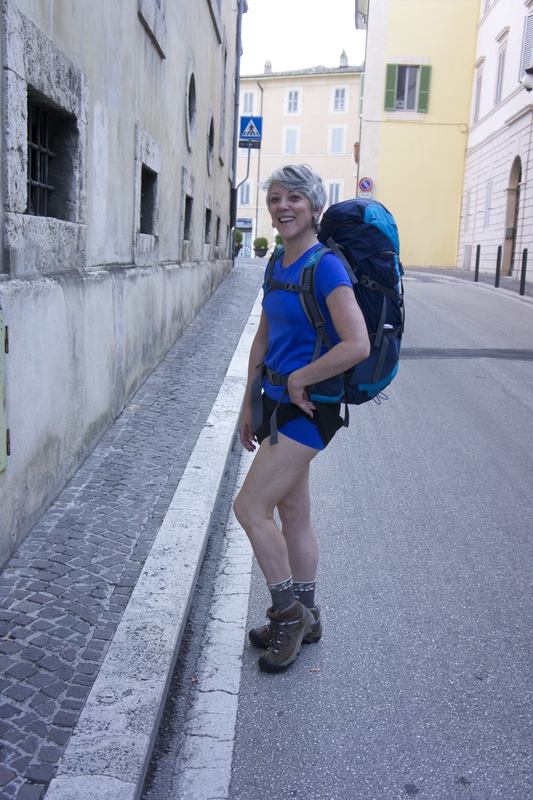 I’ve learned a lot about a wonderful and quirky GPS device, about a great camera on loan to me, about myself, and about the difficult and beautiful way I’m walking from Florence to Assisi to Rome. I should say first of all that I’m fine, my health is fine, all my gear is intact, I’m not lost (at the moment) and I’m having a good time. I should also say that in the last few days I have been dealing with very hot temperatures, long days of walking and some poor way marking that has meant I’ve sometimes had to invent my own way to get from one stop to another. And let me say too that there has been some good company along the way. 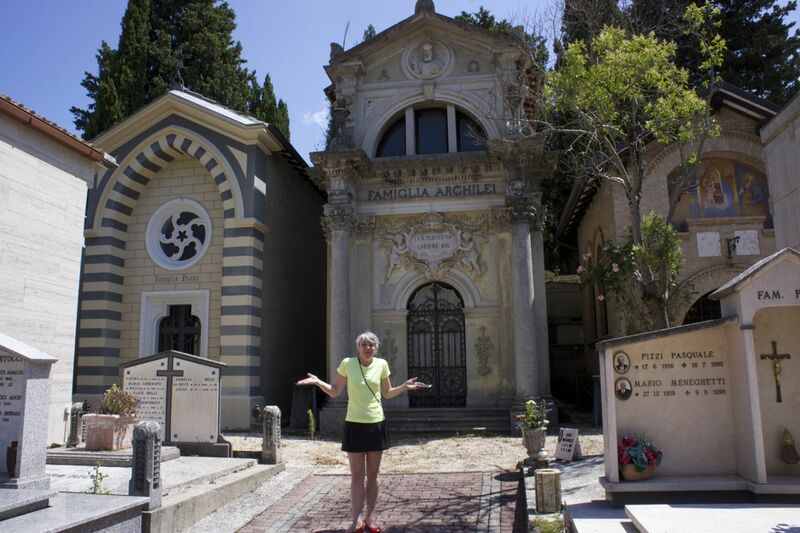 Dear Jacqueline has been with me since La Verna, three days ago, but unfortunately her knee has given out and she’ll be taking the bus or train to Gubbio and then on to Assisi, skipping ahead about five days and then heading back to Vienna. I’ve met other pilgrim friends — three Italians, a Frenchman, an older German couple and three fun mental health professionals from Lübeck, Germany. But this walk is different than any other walk I’ve done. What makes it most different is that I’m working as I walk. I walk with the GPS in my right hand, with my iPhone in my left hand, and with my camera strapped around my neck. Every step I’m looking for a good photograph, making sure I don’t miss a turn in the way for the GPX way marks I’m creating, and describing it all into a dictation program on my iPhone. Every day I learn more about the GPS device. I learned yesterday that if I stop the stopwatch function I also stop the track recording. This is bad. In my futile attempt to save battery I just erased the steps I’d walked (though I later found a way to recover them). As I walk, though, I find that I’m thinking not about myself but am thinking about how best to describe what I’m going through for future pilgrims who will read The Way of St. Francis. I’m taking the sights of this walk and trying to explain it in words that will go on a page, along with a few maps and photos. How do I condense all this experience into a book small enough that pilgrims will be willing to toss it into their backpack with them? How do I make sure they don’t get lost (like I have 3-4 times in 9 days)? How can I be certain I haven’t missed a turn or a landmark that will be explain where they’re at and where they should go? How also do I represent the amazing sights along the way, like the serene Santuario della Verna, nestled atop a mountain in the Central Apennines? So many questions, and as I walk ahead and blindly speak into my iPhone I recognize I won’t have the answers until I finally sit down with all the material at the end of my walk and begin to flesh out what can and can’t go into the guidebook. At that point I will probably be hundreds or thousands of miles away from the trails that are the source material for the book, and I will just have my recordings, my photos, a pile of receipts and some random memories of hot, long, beautiful days in Tuscany, Umbria and Lazio. Oh, and I’m using my Italian every day. 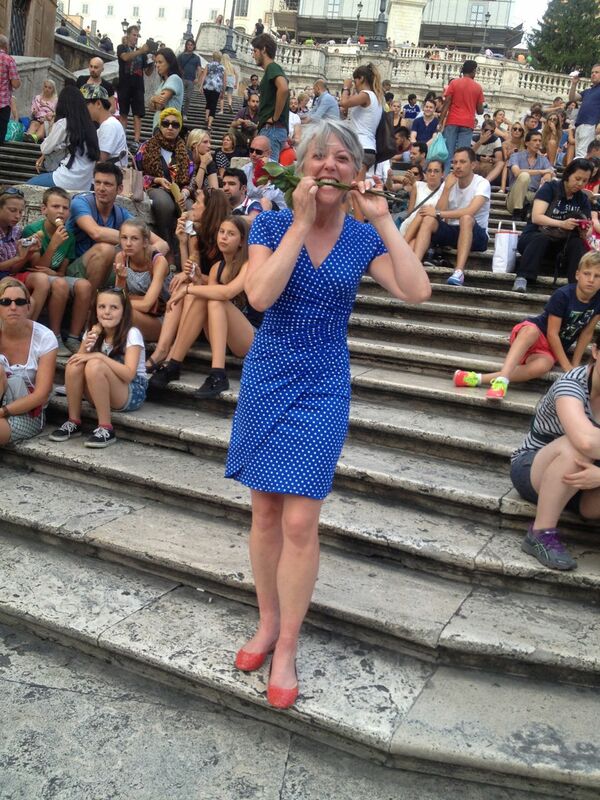 I wish I’d listened better to Flora, David and Maria of Comitato Linguistico in Perugia. But even though I wasn’t the best student I’m putting their helpful lessons to work all the time, and my Italian is getting better.